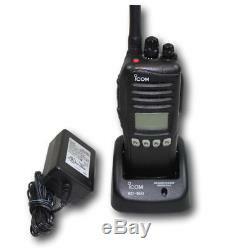 Icom IC-F3161DS VHF 136-174 Mhz 512 Channels 5W IDAS Digital. 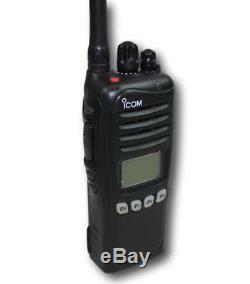 Icom VHF radio - model number IC-3161DS. This is a 5 watt, 512 channel radio with a band split of 136-174 Mhz. This unit is capable of both analog and IDAS digital operation. Radio is in great condition and guaranteed fully operational. Unit comes complete with antenna, lithium ion battery, belt clip and rapid charger. Radios are capable of both wide band and narrow band operation (6.25 Khz in Digital Mode) They can operate in both conventional and LTR trunking formats. Free programming is available for up to 16 channels. LTR/CONVENTIONAL/ DIGITAL MULTI-MODE LAND MOBILE! Designed and built for advanced communication needs, the IC-F3161D series handhelds are feature-rich with built-in multiple signalings and LTR trunking capability. Two optional slots support numerous extension capabilities including IDAS digital operation. UT-126H is already installed in IC-F3161DT/DS, F4161DT/DS. 512 memory channels with 128 zones. The 512 memory channel capacity with 128 zones allows you to divide and store a variety of channel groupings for versatile and efficient fleet management. IDAS, 6.25kHz digital mode ready. The IDAS 6.25kHz digital mode is available with the UT-126H digital unit. The IC-F3161D series has a large dot matrix display to show information with high resolution characters. The display setting is programmable to show one line and 12 characters, or two lines and 24 characters. The bottom row shows assigned functions to the [P0] to [P3] buttons. Voting scanning (Analog mode only). The Voting scan detects the signal strength level of repeater sites and automatically selects the strongest station, useful for roaming between 2 or more repeater sites. Once you program for voting mode in a memory zone, you can easily start voting mode operation by changing the zone setting. Loud audio output with BTL amp. The IC-F3161D series employs a BTL amplifier that increases the audio output and the built-in audio compander provides clear, low noise communications. Built-in inversion type voice scrambler and optional UT-109R and UT-110R for higher security. Inversion type voice scrambler is not compatible with UT-109R/UT-110R voice scrambler. The mode independent setting automatically selects the scanning list, according to the operating channel. IP55 dust-protection and water jet resistance. Optional man down unit, UT-124R and lone worker function. Embedded ESN (Electronic serial number) and more.. We will only program up to 16 channels and do not program for trunking systems. 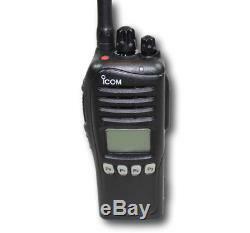 The item "Icom IC-F3161DS VHF 136-174 Mhz 512 Channels 5W IDAS Digital" is in sale since Thursday, July 27, 2017. This item is in the category "Business & Industrial\Facility Maintenance & Safety\Surveillance & Alarm Equipment\Two-Way Radios". The seller is "erac1" and is located in Lakewood, Colorado.